I had the problem that I received a bunch of MTS files and needed to create a DVD from them. I didn’t know the MTS format and even though VLC handled them well I needed a method to convert it into something more useful. It turns out that MTS is a video format developed by Sony and Panasonic and is also known as the AVCHD format. AVCHD is HD video format based on the MPEG4 video codec. So I needed to convert and downscale this HD video and make it playable on a DVD. Once I had created all the mpg files I pasted them together to one mpg file. 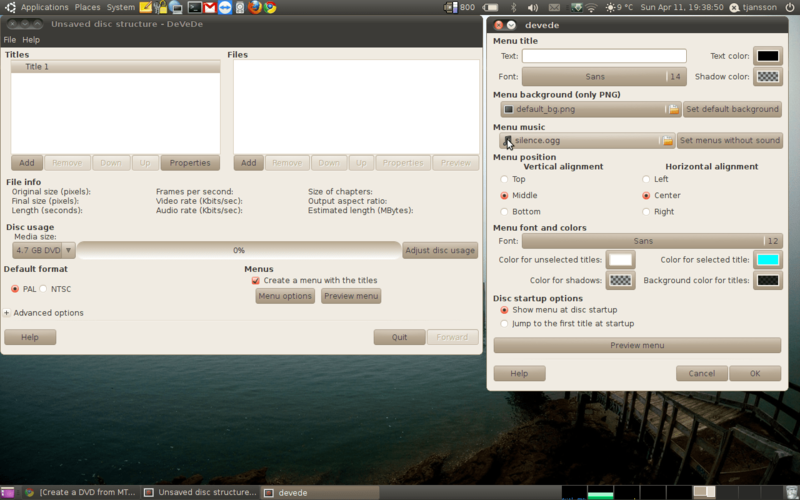 The only thing missing to create a complete DVD was some kind of DVD menu and as I found out this could be done using devede, which is in the Ubuntu repositories. Finally I extracted a sound bit from the video using ffmpeg. This sound bit I wanted to use when the DVD menu was playing. I also graped a screenshot from the video to use as the DVD menu background. Finally I loaded up devede and put it all together to a iso file which afterwards could burn out. I won’t go in to details with devede but this snapshot should show how easy it is. Awesome post! I hate proprietary formats, thanks for doing the research for the mencoder string to get it to work in DeVeDe and saving me the time.